Today I mailed off the March ATCs from my monthly ATC Swap. I love knowing that I am a part of this fun and also that I can send off some happy mail to some of my crafty girlfriends. April is National Letter Writing month. I enjoy receiving mail and miss receiving hand-written letters in the mail. Email and texting seems to dominate the norm of communications these days so I am naturally drawn to the celebration of the written letter. 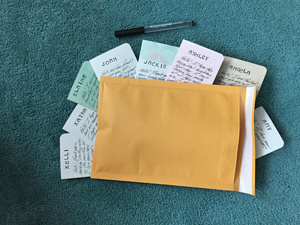 Since I was already going to mail out the ATC packages, I went ahead and wrote notes to each person. 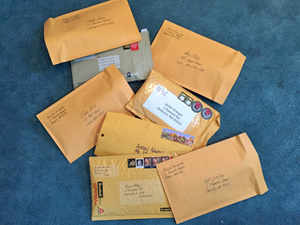 Since I had 8 people to mail to, I can subtract 8 letters from my 30 for this month. If you find time, whether you want to challenge yourself to 30 letters or cards, or just write one letter this month. It’s great for the postal service and it’s great for you and the recipient. It also helps me with my OLW (one little word) for this year – Connect. It is another way for me to connect with family and friends. I am glad you received it. I hope you can decipher the hand writing. I am a bit rusty.